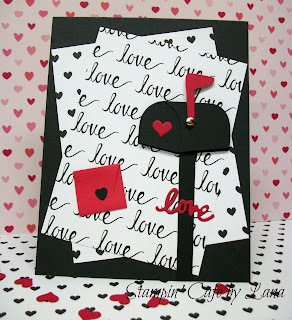 My first Valentine card is made with Stampin' Up supplies from the "Sending Love Suite." That then led me to create the "Mailbox Sending Love" card below using a Cricut cut and paper from the "mint to be fab" 12 x 12 paper pack from the Paper Studio. The supplies I used are detailed below. Patterned Paper Layer: 2-5/8 x 2-5/8 inches, cut using "Stitched Framelits" by Stampin' Up. 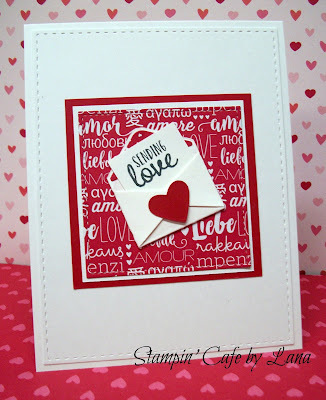 Paper is "Sending Love DSP" by Stampin' Up. Mini-envelope and liner - "Love Notes Framelit Dies" by Stampin' Up. Greeting: "Sealed with Love" by Stampin' Up. Mailbox - Cricut Create a Critter Cartridge, p. 67, cut at 1-1/2 inches. I cut the shadow layer, the mailbox layer, and layer 1, cutting away the smiley face. I also cut the red flag (Layer 2). The post is a handcut 1/4 inch strip. I attached the flag to the mailbox with a small brad so it actually moves up and down. I added a small punched red heart to the front of the mailbox. I layered the Layer 1 cut on top of the mailbox cut, and then attached those layers to the shadow layer with dimensional dots. Mini Red Envelope - hand cut using a 1-inch strip of paper, folded and trimmed to resemble an envelope. I added a small punched out black heart as a seal. Stay tuned until Valentine's Day for more Valentine projects and cards! Coffee Card - "For You"